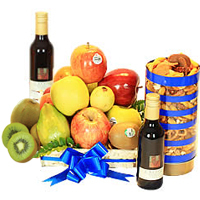 Product description: Bring people you love, closer to you by gifting them this Alluring Land N Sea Basket with Free Message Card that will create a magical spell of your lovely feelings upon them. 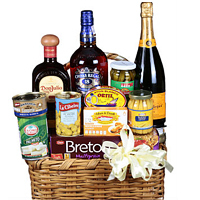 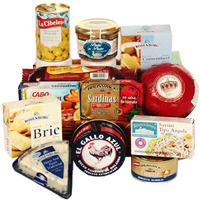 This delightful Basket comes with 1 Dutch Edam Cheese 1kg, 1 Dutch Gouda melted Cheese 300g, 1 Danish Brie Cheese 125grs, 1 Danish Camembert Cheese 125grs, 1 Danish Blue Cheese 100grs, 1 European style Smoked Salami 250g, 1 imported Paté (Salmon, Pig or Duck depending on availability) 85grs, 1 Crab's Can 170grs, 1 Canadian Sardine's Can 106grs, 1 Smoked Mussels Can 85grs, 1 Elver of Surimi Can 120grs, 1 Shrimps Can 113grs, and 1 Stuffed Olives Can 300grs. 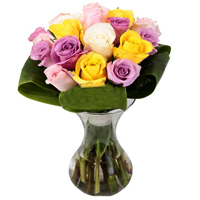 Add spark to your life as well as those who matter to you with this Elegant Bouquet of 12 Mixed Color Roses with Green Foliage enriched with the flavors of happiness and vibrancy. 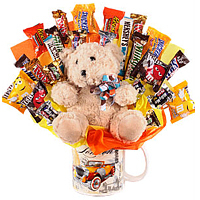 This giant mug contains: 20 delicious mini bars of chocolate different kinded: twix, m & ms, milkyway, reessert, herseys, snickers, three musketeers, etc, Teddy bear 20 cm approx. 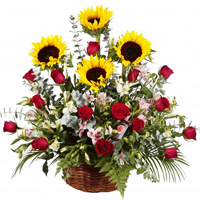 Be happy by sending this Decorative Mixed Flowers Basket Arrangement to your dear ones on Valentines Day and see the joy it brings to their life. 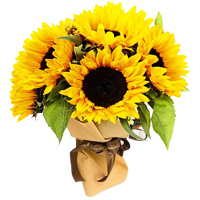 This beautiful array of Flowers exhibit 12 Red Roses, 4 Sunflowers, Alstroemerias and lots of Green Foliage.